Dinosaurs descended from reptiles and evolved into today's birds, but their growth and sexual maturation were more like that of mammals - complete with teen pregnancy, according to a new study by University of California, Berkeley, scientists. Though dinosaurs grew for much of their lives, they experienced a rapid growth spurt in adolescence, like mammals, said UC Berkeley graduate student Sarah Werning. She and Andrew H. Lee, a recent UC Berkeley Ph.D. recipient who is currently a postdoctoral fellow at Ohio University's College of Osteopathic Medicine in Athens, Ohio, have now shown that dinosaurs reached sexual maturity near the end of this rapid growth phase, well before reaching maximum body size. Medium-to-large mammals, including humans, also are able to reproduce before they finish growing. The finding, Werning said, suggests that dinosaurs were born precocious and suffered high adult mortality, making early sexual maturity necessary for survival. "This is an exciting finding, because age at sexual maturity is related to so many things," said the students' advisor, Kevin Padian, who is a professor of integrative biology and a curator in UC Berkeley's Museum of Paleontology. "It also shows that you can't use reptiles as a model for dinosaur growth, as many scientists still do." Pinpointing the age of reproductive maturity "opens up so many complementary avenues of dinosaur research," Werning added. "You can talk about dinosaur physiology, lifespan, reproductive strategies. And you could use this technique to look at all kinds of extinct animals." The conclusion, reported the week of Jan. 14 in the online early edition of the journal Proceedings of the National Academy of Sciences, comes from an analysis of the only three dinosaur fossils that have been definitively identified as female. Thin slices of these dinosaurs' fossil bones all show an internal structure similar to tissue found in living female birds - a layer of calcium-rich bone tissue called medullary bone that is deposited in the marrow cavity just before egg-laying as a resource for making eggshells. Dinosaurs, which also laid eggs, apparently stored calcium in similar structures prior to ovulation. In their new paper, Werning and Lee report that leg bones from the carnivorous Allosaurus and the plant eater Tenontosaurus both contained this structure, which means both creatures died shortly before laying eggs. The researchers concluded that these dinosaurs were both mere adolescents, because the Allosaurus was age 10 and the Tenontosaurus age eight at time of death, and prior studies have shown that these types of dinosaurs probably lived up to 30 years. Werning and Lee also confirmed that a third bone, from a female Tyrannosaurus rex (T. rex) reported by Museum of the Rockies paleontologist Mary H. Schweitzer in 2005, contained medullary tissue upon the dinosaur's death at the age of 18. Werning noted that all three dinosaurs might have reached sexual maturity much earlier. "We were lucky to find these female fossils," Werning said. "Medullary bone is only around for three to four weeks in females who are reproductively mature, so you'd have to cut up a lot of dinosaur bones to have a good chance of finding this." In the past 10 to 15 years, studies of dinosaur bones have revealed much about the growth strategy of dinosaurs because bone lays down rings much like tree rings. If, as with trees, each ring signifies one year, then dinosaurs grew rapidly after birth and continued to grow over several years until death. Despite the presumed close relationship between dinosaurs and reptiles, dinosaurs grew faster than living reptiles, and their bones had a bigger blood supply. Among living vertebrates, only birds and mammals exhibit such fast growth. Birds and small mammals grow quickly to maturity and then become sexually mature, but large mammals reach sexual maturity just before growth slows. Attempts to determine when dinosaurs became sexually mature, and thus whether they more closely resemble birds or mammals, have been difficult because there have been no clear signs of reproductive maturity in dinosaur skeletons. Hence the excitement when Schweitzer discovered medullary bone in a T. rex femur. Though other paleontologists have searched fruitlessly for similar signs in fossil bones, Werning and Lee found success by focusing on Tenontosaurus, perhaps the most common and most boring dinosaur in North America, and Allosaurus, a T. rex-like predator. Tenontosaurus lived in North America during the Early Cretaceous period, 125 to 105 million years ago, and was an ancestor of the duck-billed dinosaurs. A common plant eater, it is known for its long tail that made the dinosaur up to 27 feet long when walking on four legs. Because fossils of these one- to two-ton beasts are common in Oklahoma, Werning was able to obtain many fossil bone slices from the Oklahoma Museum of Natural History. 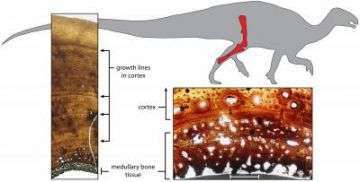 Both a femur (thigh bone) and a tibia (shin bone) from the same fossilized Tenontosaurus showed medullary bone, while growth rings in its bones indicated the pregnant dinosaur was eight years old. "These were prey dinosaurs, so they were probably taken out when really young and small or when old," Werning said. "So, if you don't reproduce early, you lose your chance." Lee, on the other hand, focused on Allosaurus fossils from the Cleveland-Lloyd quarry in Utah, where several thousand Allosaurus bones from at least 70 individuals have been discovered. A smaller and older version of T. rex, Allosaurus lived 155 to 145 million years ago in the late Jurassic period. Lee found one tibia with medullary bone from the University of Utah vertebrate paleontology collection. The two researchers are continuing to analyze thin slices of fossilized dinosaur bone in hopes of finding more skeletons with medullary bone.